A couple of people have asked for an update on Ladybug, our mini horse. As most of you know, she's one of the "helpers" at the nursery, but she had a rough last year. A little over a year ago she foundered, with laminitis that made it difficult for her to walk. However with the help of a good vet and an excellent farrier she is totally recovered and is back to her old self. She continues on a low carbohydrate diet, but now regularly pulls a cart and goes for walks to the local park and to the University of Portland campus. These photos were taken by Lynn-Marie a couple of days ago. Back to succulent plants tomorrow. If you ever wanted proof that I make mistakes, this is it! I admit, we're not experts on the Trichocereus hybrids. And I got the name of this one way wrong. First of all, I misread the label. It said 'June Noon', not 'June Moon'. But then I did a little research - it didn't take much - and this clearly is not 'June Noon'. The Southern California grower had the wrong label on it since the flower's the wrong color. So it remains an "unnamed" Trichocereus hybrid. So we don't have a name. Maybe someone out there can identify it for us. I guess without a name, it can't be any good, right? Well, maybe for some people. But we have fallen in love with this flower. The name doesn't really matter. I'll be posting a photo or two later tonight, but in the meantime just a note to remind those in the Pacific Northwest of the U.S....the Oregon Cactus & Succulent Society will be holding its second show and sale July 16, 17 and 18 at the Stark Street Portland Nursery. This will be a large sale than the one we just had. We expect at least 3 or 4 vendors, so there should be a great deal of selection. I just checked it out and the link doesn't seem to be working to sign up. So...just show up. We'll crowd you in! After a long, cool and wet Spring, it looks like we'll get only our second 80 F day today. The plants are liking it. The Thelocactus schwarzii (Syn. : Thelocactus bicolor var. schwarzii) opened it's beautiful flower today and basked in the warm sun...as did we - for a little while. But no matter how busy, you just have to take time to enjoy the flowers. If you don't, why grow them at all? Another plant which was flowering is Lobivia 'Pink Ice' (Syn. : Echinopsis 'Pink Ice'). This is an old hybrid which hasn't outlived its usefulness but is nevertheless sometimes hard to find. It blooms most of the summer and remains small, making it a fine windowsill plant. We're out of stock at the nursery, but still have our stock plants and just love that flower! We just received word of the death of Bill Beaston. 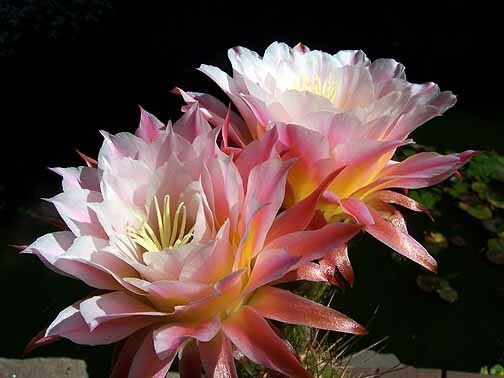 Bill was a "Life Member" of the Oregon Cactus & Succulent Society. I'll note more about him a little later on in this blog. Another Stenocactus in the crispatus complex. I know, it's supposed to be a "late summer" flowering plant, but for us they've been flowering without any summer so far! A new addition to the plants we carry at the nursery is Echinocereus pulchellus. The flower color is variable, as indicated in the first picture, and the plants flower their little heads off. Not really "little", as they grow to 6-7 cm. in diameter. We have a nice little clump of Tephrocactus geometricus (syn. : T. alexanderi var. geometricus) which was flowering for the last couple of days. The flower doesn't show it's true colors, as it has a slight pinkish cast and a darker mid-stripe on each petal. New segments, like the one to the left, are purplish to begin with. Here's some photos from the sale. The weather didn't cooperate so we didn't do as well as we might have hoped. Today, of course, two days after the event, we're finally getting some appropriate early summer weather. Of course we'll be back at it again in July and the weather should be OK by then. Last year it was in the 90s (F). I have some photos to share; was just too tired to prepare them for the blog. I promise, back to some interesting photos tomorrow. Thanks for your patience. I probably won't have time to post much during the show & sale. I'll be loading plants out tomorrow afternoon; it'll take about three trips with our van (need to get a larger truck for this). The sale is then on Friday, Saturday and Sunday. I'll take photos, but I'll really be beat each evening. Next week then! Finally, a picture of Sulcorebutia canigueralii. It's been blooming like mad and putting on quite a show. Just to let you know, we have renamed Angel "Rojita". A far better name than Angel. I've been busy the last few days. I'm retired, but still do some things related to my profession. A friend had requested that I officiate at the interment of her ashes, which I did on Friday, and today I filled in for a pastor who was out of town. But the real time investment has been in preparation for the OCSS sale next weekend. Lynn-Marie has been potting up cacti for the last few days (somewhere between 15 and 20 flats) and is just now getting to the other succulents. I kind of work in the background preparing potting soil, carrying things around, going for supplies, etc., but have also potted up a flat of Lithops and will pot up another flat tomorrow before going to my cardiologist appointment. Getting ready for a sale like this is quite time consuming since, being an internet-mail order nursery, our plants are generally grown in trays and aren't individually potted. The Pleiospilos plants above look about as exhausted as we are! Hope to see some of you locals out at the sale. Yesterday and today another of our epis decided to bloom: Epicactus (Epiphylum) 'Clown'. It's not one to readily bring forth blossoms, but when it does, whew! It's one of our favorites, but for the first few years we wondered if it would ever bloom. It was worth the wait. It now blooms dependably, but usually just one bloom a year. These are still fairly young, seed-grown plants, showing a diversity of patterns but pretty much the same coloration. These are new to us, but I've already fallen in love with them...at least to the degree that one can "fall in love" with a rock that's not a rock! These are gorgeous, slow-growing, miniature plants from Mexico. Seed grown and on their own roots, they reward us for our patience by providing flowers from Spring and throughout the Summer. Their reputation for being hard to grow isn't really justified, at least for adult plants. Don't over-water during the warm periods of the year and hold back on the temptation to water during the colder time of the year. Grow best in a good mineral substrate without a lot of humus. We have a new member of our family - "Angel" - a Peruvian Paso. No, this isn't our back yard; it's the Abbey Creek Stables where we board Angel. She just made the huge transition from just outside of Phoenix, Arizona (100+degrees F) to Portland (pushing 70F). Actually, we would like to come up with a new name, maybe in Spanish, to fit her heritage. Any suggestions??? By the way, Jardinera is at a new home; her "spirit" was a little much for our grandchildren! Almost anyone who has grown succulent plants has tried their hand at the "Split Rock" - Pleiospilos nelii. It's not really all that hard to grow and the flowers are fantastic. Lynn-Marie was working in the greenhouses today, preparing an order for South Korea, while I was out getting supplies, and she took the photos. These have been flowering for the past several days. No matter how long we've been growing these little gems, they still amaze me. This is an upright growing "giant peanut" type plant with iridescent rose flowers. A hybrid from Renee O'Conell, I guess it could now be called Echinopsis 'Rose Quartz', since both of the parent plants (Chamaecereus & Lobivia) have been swallowed up by the same genus, Echinopsis. Some people are always asking how to get these plants to flower. A good beginning point is to remove the straw flowers that are often glued to the tip of the plant by some growers. (An aggravating practice at best!) This plant bloomed on Saturday without any special assistance from anyone. Haven't had much time to do much photography lately. I haven't even felt like it. May was the third rainiest May on record and it was pouring for the last couple of days...until today, when it suddenly decided to be summer for a day! Had to get the lawn mowed quickly, before the rain returns tomorrow. Yuk. Hopefully, it won't be raining then. Some places pray for rain. We pray for sun! Not very often offered in the trade, this is Haworthia pulchella var. globifera grown from seed (PVB7338). This is not a fast or large growing plant. The pictured plant is about 1 inch across (2.54 cm). It's from the area of Ladismith in South Africa. Today's post is of one of those classic cacti, this one - Astrophytum capricorne - from northern Mexico. It blooms in summer with sweet smelling 7.5 cm wide flowers which are yellow with a red center. It grows well from seed and is highly variable. It can be rot prone, so grow it in a porous mix and keep it dry during the winter. I couldn't resist taking this photo the other day as the beauty of the form always keeps me coming back.